Inder Loves Folk Art: Black Acacia. 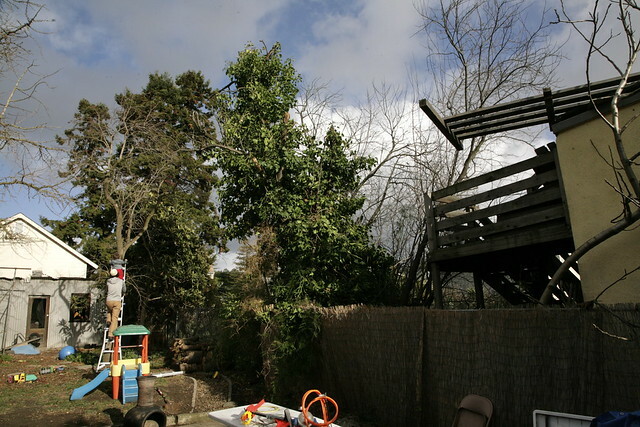 When we moved into our house six years ago, there was a large black acacia tree overhanging our back yard, in our neighbor's yard but right on the fence line. It was evergreen, and cast a deep shade over our back patio year-round. And it dropped leaves and little pink seed pods in abundance, which in turn were constantly being dragged into our house by our dogs and kid. I'm very pro-tree, but this was not a species I would have chosen for my backyard (and we have way too many trees on our property to begin with; when we moved in there were no less than nine badly maintained and half dead trees in our small backyard). But if this were all, we'd probably just live with it. After all, we live with a lot of less-than-ideal things on our property. Like a lot of folks these days, we simply don't have the money (or equity) to make large improvements. Here's the problem: Over the years, this tree just seemed to get bigger and bigger. And lean deeper and deeper into our property, until the fence was bowed out several feet to accommodate it. Even I couldn't ignore the evidence that this tree was essentially slowly falling onto our property. An enormous branch jutted out over Rebecca's bedroom and scraped the roof during storms. Arborists getting ready to remove that crazy leaning tree. The tree became known around our house as "Steve's Arch-Nemesis" because of all the time he spent trying to trim it back and disposing of trimmed brush and wood that didn't even seem to make a dent in this giant monstrosity (it turns out branches look a lot smaller when they're on the tree than when they're on the ground). It was time to remove this tree, before it crashed through our roof during a winter storm. Since I wanted the tree gone and my husband alive, we opted to hire professionals. 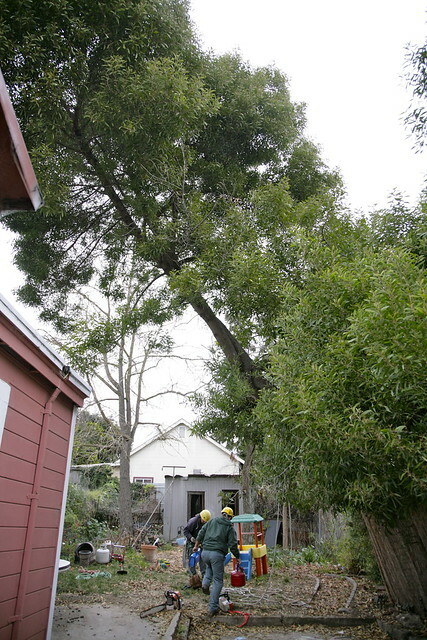 We had no problem getting a tree removal permit from the City of Oakland. 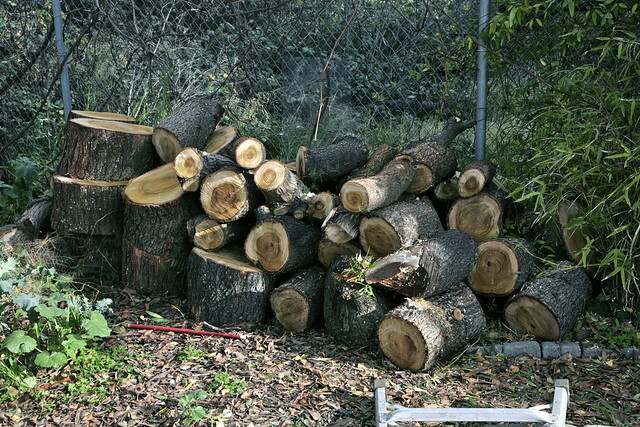 The City Arborist/Inspector said, "Black acacias aren't good for much besides firewood" and waived the permit fee due to the hazardous state of the tree. Well, as of Wednesday, it's gone! The workers finished the work minutes before it started raining, and it hasn't stopped since, so the timing couldn't have been more perfect. It doesn't really look like much - basically, we removed an ugly tree to reveal an ugly fence and an ugly dead tree covered with ivy. But it's a major improvement in two areas, at least: (1) Sunshine!! (2) Safety. It's a little hard to tell right now, because it has been overcast and raining for days, but I think this is going to open up our back garden a lot and allow us to plant a much wider variety of flowers and vegetables, including some more heat-loving plants. I'm pretty excited. And I'm sure Rebecca will sleep a little better knowing that there will be no branches crashing into her bedroom, this winter, or ever. And we scored a huge amount of firewood! In closing, it's pretty awesome. We've never had a lot of money to make huge improvements to our house or garden, but slowly but surely, we are making it a little nicer. And that feels good. My heart was beating hard as I took this photo. As you can see, Joe was unfazed. Also, in case you had forgotten, my son Joe is fearless, bold, brave, and nimble. All I can say is, he didn't get this from me. It sounds like removing that tree will improve many things for your family! I can't get over seeing Joe on that ladder. What a climber! Yay! That should make a huge difference in the light you get- that tree looked humongous! Wow, that tree was BIG. So glad it's been taken care of. And yay sunshine! Will you be trying tomatoes in the back this year? Wow, huge change! It must feel like a huge weight off. Yeah! Sunshine and safety! Those sound like two pretty good reasons to say goodbye to a tree! 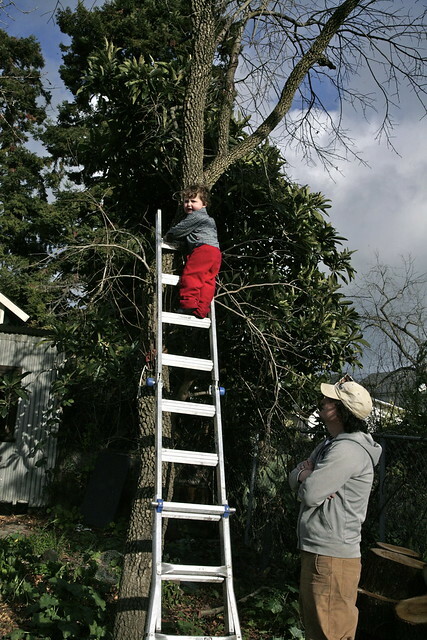 And that picture of Joe on the ladder is awesome - he is one fearless little boy! Broke just means you need to come over next weekend and let me feed you tasty foods and send you home with a ridiculous amount of lemons.